Torr03 - The items in this grouping focus upon the upheaval of the labour market and beginnings of the labour movement which were occuring during Tom Mann's lifetime. 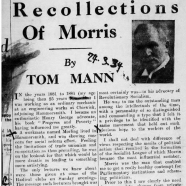 From machinery replacing skilled tradesmen to strikes, union expansion and the first Labour Party politicians; this research explores the events that made Tom Mann a renown Communist Party activist. CP/IND/TORR/01/04 - Synopsis of contents, letter from Tom Mann to Dona Torr, miscellaneous autobiographical writings by Tom Mann, Dona Torr's notes and background documents. CP/IND/TORR/01/05 - Material relating to 1891 and 1892 [Volume 1 finished with 1890] and with a particular emphasis on events at Bradford in West Yorkshire. These items include descriptions of marches, strikes, and organisers being attacked by men hired to break strikes. They also discuss the beginning of working men seeking to enter parliament through the Labour movement. Background material - 19th century politicians. CP/IND/TORR/01/06 - Scope and Content: Biographical notes and quotations from 19th century politicians. These notes also cover incidences of industrial action with an emphasis on actions taking place in Leeds, West Yorkshire and in Rothwell, Adel and Woodhouse in particular. CP/IND/TORR/01/07 - Cuttings and correspondence regarding William Morris - including by Tom Mann. CP/IND/TORR/02/01 - Material on artisans and early trade unions. Including commentary on the demise of the skilled crafts and the growth of machine use. These sources include a set of minutes allegedly pertaining to a 'Select Committee on Artisans and Machinery 1824'. A variety of industrial disputes are discussed through first-hand accounts. CP/IND/TORR/02/02 - London Trades Council - notes on the late 19th century. Includes records of unions' affiliated members in 1947 and details of various industrial actions between 1938 and 1956.